England’s number one Joe Hart is expected to leave Manchester City on a permanent deal in the summer, having spent two seasons out on loan. Hart, 30, will be heading into the final 12 months of his City deal come the end of the season, giving the club one last chance to receive a fee for him, which they failed to do so last summer. 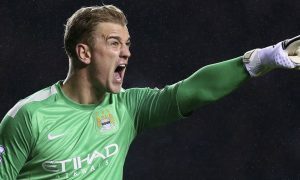 Rather than lose him as a free agent in 2019, City are prepared to accept between £3million and £6million for Hart, the Daily Star Sunday reports. Hart is currently on loan at West Ham, who have just appointed David Moyes as manager, and it remains to be seen if the Hammers will stump up the cash to sign Joe permanently when his loan term expires. One thing that is certain is that there is no way back for fan favourite Hart at the Etihad, with Ederson proving to be a hit in goal following his £34.9million move from Benfica in the summer. In addition to Claudio Bravo, City also have young Angus Gunn on the books, the talented 21-year-old on loan at Norwich, who recently earned a surprise call-up to the England senior set-up, recognition of the talent and potential that Pep Guardiola may look to use in the near future.